Don’t have tostadas in the regular dinner rotation? We’ll change that. 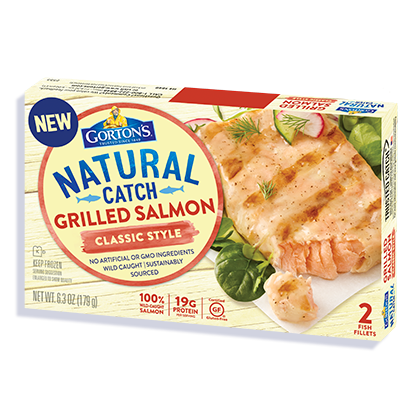 This recipe from Slender Kitchen, featuring our Classic Grilled Salmon and a medley of veggies, is sure to be a new quick and easy go-to. Preheat the oven to 400°F. Stir together the olive oil, cumin, paprika, chili powder, garlic powder, onion powder, and pepper. Spray a baking sheet with cooking spray. Place the salmon filets on the baking sheet and drizzle with half of the spice mixture. Toss the remaining spice mixture with the zucchini and place on the baking sheet. Cook for 14-16 minutes until salmon is cooked through and zucchini are tender. During the last 6-8 minutes of cooking, place the corn tortillas in the oven directly on the oven rack to create your baked tostadas. Watch carefully to make sure they don’t burn. They are ready when they are nice and crispy, like a tortilla chip. Meanwhile, make the mango salsa by combining the mango, corn, red pepper, red onion, cilantro, lime juice, cumin, salt, and pepper. 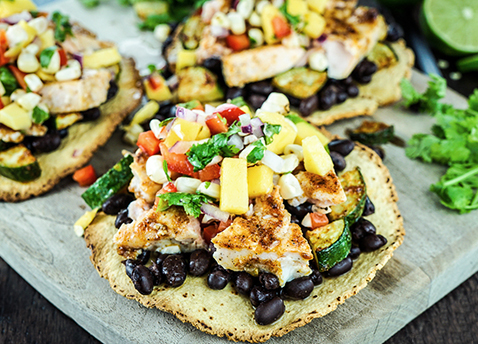 Assemble the tostadas by layering on the black beans (warmed or room temperature), salmon, zucchini, and topping everything with the mango salsa. For some extra kick, add some sliced or diced jalapeños on top.